Elliot Coues was born on Septermber 9, 1842 in Portsmouth, New Hampshire. His father Samuel Elliot Coues was a merchant and worked in the United States Patent Office, which caused him to be away from his family in New Hampshire starting when Coues was eleven. As a child Coues was fascinated by animals and was only interested in books that contained them.. When he moved to be with his father in Washington D.C, Coues went to the Smithsonian and there he met the naturalist Spencer Baird, the first curator of the Smithsonian, who would be his mentor. He published his first technical paper at the age of 19. He attended Gonzaga College High School in Washington D.C. and then Columbia College (which later would be renamed George Washington University) also in Washington D.C. Coues remained at Columbia College for ten years, earning a PhD and an MD. Coues enlisted in the U.S. Army in 1862 as a medical cadet. In 1863 he was promoted to acting assistant surgeon and in 1864 to assistant surgeon. .
Coues' military career took him all over the United States, with postings in Arizona, North Carolina, California and North Dakota. Coues was an prolific writer and wrote many works on ornithology and natural history. 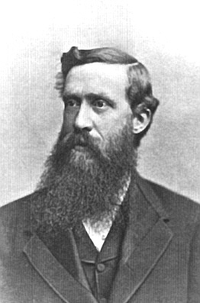 In the Army he got the chance to join expeditions that explored parts of America, serving as both naturalist and surgeon on the United States Northern Boundary Commission form 1873-1876 and from 1876 to 1880 he served as secretary and naturalist to the United States Geological and Geographical Survey of the Territories. While in the army he authored 300 works and papers. He resigned from the army in 1881 to devote himself more fully to literary and scientific pursuits. After resigning from the Army he returned to Washington D.C. In 1877 he was appointed professor of Anatomy at the National Medical College and that same year he was elected to the National Academy of Sciences. He was one of the founders of the American Ornithologists Union and served as its president. Coues' book A Key to North American Birds first edition was published in 1972. The book was at the time a unique work of ornithology, one which for years other guides to animal species would follow. Other important works by Coues included A Checklist of North American Birds (two editions) and Field Ornithology. Coues identified for the first time many unknown bird species and introduced the trinomial nomenclature used to distinguish subspecies of animals. All living species are known by their scientific name composed of Latin genus and species names. Coues introduced using a third Latin name for subspecies. Coues was also important in mammology, publishing North American Fur Bearing Animals in 1877. Coues died on December 25, 1899 at Johns Hopkins University Hospital in Baltimore, Maryland, during an operation to cure an afflicted throat.